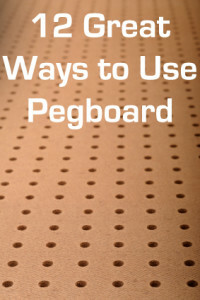 11, okay 12 ideas to use pegboard…but just a drop in the bucket! Loved seeing this! Everyone thought I was crazy when I took all the peg board from my in-laws when they were getting rid of. Peg board is awesome. I would love to send you a photograph of a pegboard display that i designed and my father built for me to use when i was doing craft shows. i have saved it and a friend recently used it to hang necklaces on at a garage sale (hence the photograph being available) i will put it in my sewing studio when i get one.